Adrian Campbell was born on March 9, 1970 in Halifax, NS. He died in October, 2008, six months after being diagnosed with stomach cancer. He left behind a loving wife, three young sons, and a life well lived. Adrian lived his childhood and adolescence in Windsor, NS. After completing a BSc at McGill University in Montreal and his law degree at Dalhousie University in Halifax, he settled in Kentville, NS where he practiced law with Taylor MacLellan Cochrane Law for 13 years. He believed in chasing one’s dreams and taking chances at “Going Big”. Prior to beginning his legal career, Adrian cycled one summer in Belgium to assess his chances of riding professionally. Adrian had a passion for competition and participated in numerous sports throughout his life – hockey, skiing, baseball, swimming, golf, body-building, and wind-surfing. He eventually focused foremost on cycling and running. 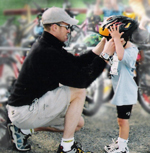 He competed locally, provincial, nationally and internationally in triathlon, duathlon, marathon, team and individualized cycling and running events. Adrian believed strongly in living with purpose and enjoying the process. He had an infectious smile and gentle laughter. He traveled numerous times to compete at the international level for duathlon and participated in the world championships in France, Cornerbrook, and Italy. He was team captain in Italy and competed at the Elite level. He was most proud of some of his local successes - particularly the Hantsport Arnold Robertson 2 Miler, which he won six times from 1999-2006. Adrian believed in tradition and sportsmanship. He received his first sportsmanship award at the age of 7 and continued to be recognized as an exemplary sportsman throughout his athletic career. 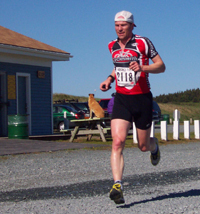 Triathlon Nova Scotia has established an Annual Sportsmanship award in his honour. Adrian believed in giving back to the community. He was a minor hockey coach, director on the Kings Meadows Foundation for the mentally challenged; he helped establish the Windsor Regional High School Scholarship fund. Adrian made time to give encouragement to others and believed strongly in the value of sport in developing character and self -esteem. Throughout his life, Adrian encouraged others to seek health and fitness through sport. First and foremost, Adrian was committed to his family and friends. Nothing gave him greater joy than swimming or playing soccer or hockey or biking with his boys and wife, family and friends. Adrian enjoyed the camaraderie of group rides, the pleasures of family afternoons, and the fun and competition of sport. At the beginning of his Grade 12 year, Adrian wrote the following declaration to himself – found among his papers following his death. The values he spoke of were those he had lived by and continued to live by throughout his life. “I, Adrian Campbell, hereby declare an oath to myself in which I promise to use my time wisely. I will not be lazy or immoral. Everything I do will be of long range or short range benefit. I will never waste time. I will be the best I CAN BE MIND, BODY, SOUL. I will put forth my greatest energy no matter what I take on. I will not put others down or cross my friends. Enemies are that. I WILL NOT CHEAT MYSELF OF MY LIFE.” (September 4 , 1987).